Jack Gibbons' wide-ranging solo and concerto repertoire includes the complete works of both Chopin and Gershwin, most of the keyboard works of J.S. Bach (including the Goldberg Variations, the 6 Partitas, the 48 Preludes and Fugues, etc. ), as well as the music of Beethoven, Liszt, Alkan, Debussy, Ravel, etc., plus his own compositions. Much of this repertoire features in his acclaimed Summer Piano Series which takes place every year in the historic university city of Oxford (visit the Concerts in Oxford page for more details). Meanwhile read on for more information on Gibbons' unique "authentic Gershwin" repertoire. 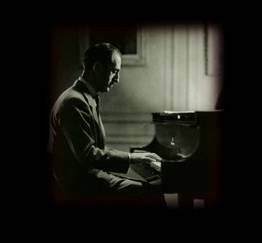 Since his death, appreciation of Gershwin's genius as a composer has continued, and continues, to grow, but his remarkable piano-playing - admired by figures as diverse as Rachmaninov, James P. Johnson, Ravel, and many others - has been largely forgotten today. Gershwin possessed not only a phenomenal piano technique but also an amazing gift for improvising on his own show-tunes, and his spectacular renditions were guaranteed to make him the centre of attention at any social gathering; indeed his playing at New York parties in the 1920s and 30s became legendary. Although Gershwin never wrote down his elaborate show-tune arrangements, he did record some of them on 78s and on piano-rolls, and these have been meticulously reconstructed, note by note, from the original recordings by Jack Gibbons; Gibbons' unique performances of these reconstructions allow this music to be heard live for the first time since Gershwin himself played it. Gershwin also frequently played his larger works for the concert hall on the piano, and likewise Jack Gibbons has recreated all Gershwin's concert works in the form of virtuoso solo piano arrangements: Rhapsody in Blue, An American in Paris, Cuban Overture, Second Rhapsody, I Got Rhythm Variations, and Gershwin's original Porgy & Bess Suite. All the arrangements are faithful to Gershwin's own, being based on the composer's own recordings, original scores, etc. Jack Gibbons' unique all-Gershwin solo concerts bring together both show-tunes and concert works, highlighting all facets of Gershwin's genius. From virtuoso transcriptions of Gershwin's concert masterpieces to recreations of Gershwin's spectacular show-tune improvisations, the whole program presents as complete and authentic a picture of George Gershwin as it is possible to give in a single evening. Jack Gibbons' performances have been described by the press as "compulsively communicative", and he always intersperses his programs with brief anecdotes and musical illustrations explaining and revealing secrets of Gershwin's piano skills in a way that is both educational and highly entertaining. "So far has Gibbons perfected his art that this was not an evening OF Gershwin but, as near as we could ever come to, an evening WITH Gershwin" (Gulf Daily News).